This week at Sourasky Medical Center at Tel Hashomer marked completion of three paramedic courses recently held by MDA, including one unique course - the first paramedics course for yeshiva students. The course is part of a new and special six-year course that combines a year-and-a-half of yeshiva study (advanced yeshiva studies course), an 11-month paramedic course defined as a pre-military course, a 10-month course in the yeshiva, and MDA preparedness. In all periods in the yeshiva, the program includes weekly volunteering in MDA. The course was completed by 17 students of the Hesder yeshiva in Ofakim. This route was offered thanks to the enlistment of the Meir Harel yeshiva in Ofakim which provided the students with the opportunity to study there. The course valedictorian is Shlomo Schatz of Petach Tikva and the exemplary trainee is Zvi Tebens of Jerusalem. The 17 new paramedics received certificates and personal equipment at the ceremony, which they will use in their work. The second cycle of the course for yeshiva students is currently under way, with about 10 students from Bedouin areas who are completing the course alongside the yeshiva students. MDA Community Vice President Dr. Eli Yaffe, one of the course initiators, says, "The unique nature of the course stems from the fact that it integrates theoretical and practical study between the three stages of the training, from emergency medic to senior medic, and full paramedic. During the period they study in the yeshiva they serve as the reserve force of the MDA General Staff for emergency incidents and go out to save lives. I'm pleased that I was able to join in developing the program and proud of the graduates of the first class." Head of the Hesder Yeshivas Meir Harel in Modi'in and Ofakim, Col. (res.) Rabbi Eliezer Schnold added, "On Hanukkah we celebrate the initiative of the few Hasmoneans for the sake of all the people of Israel. Even today we face many challenges, and the few need to take responsibility in order to advance society. 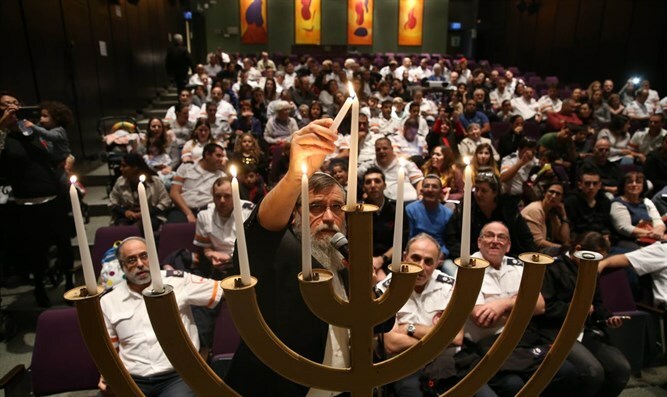 Thanks to the MDA staff and to the head of the organization, partners in making the dream of running the course come true, and to the fact that yeshiva students can be partners in the holy mission of saving lives in the army and in civilian life." MDA Director-General Eli Bin summed up and said that "the Gemara says, 'Anyone who saves one soul in Israel it is as if he saved an entire world.' I'm proud of the graduates of the first paramedic course for yeshiva students who have integrated the idea of saving lives within the world of Torah study. They have acquired values in their homes and yeshivas, and I wish them all peace in their military service and a safe return home to MDA. "